Some examples include - but are not limited to - shows found on PBS ("NOVA"), Discovery Channel, Science Channel, National Geographic Channel, TED Talks (online videos), and the History Channel. 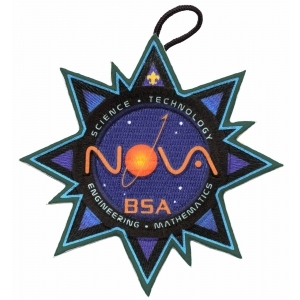 The NASA website at www.nasa.gov has some short multimedia clips that involve projectiles, aviation, space, weather, astronomy, or aviation or space technology. You may choose to watch a live performance or movie at a planetarium or science museum instead of watching a media production. You may watch online productions with your counselor's approval and under your parent's supervision. Read (about three hours total) about projectiles, aviation, space, weather, astronomy, or aviation or space technology. Discover the latitude and longitude coordinates of your current position. Design a pitching machine that will lob a softball into the strike zone. Answer the following questions, then discuss your design, data, and experiments - both successes and failures - with your counselor. At what angle and velocity will your machine need to eject the softball in order for the ball to travel through the strike zone from the pitcher's mound? Experiment with different starting heights for the marble. How do the starting heights affect the velocity of the marble? How does the starting height affect the jump distance?